In post SNL movie-making, the cast members of Lorne Michaels' legendary sketch show have often embraced niche work, playing variations of the same character in film after film whether it's David Spade's quick-witted cynic or Adam Sandler's man-child who buries a startling amount of rage just below the surface. Of course and similar to Other Guys star Will Ferrell, the versatile and talented SNL alumni have taken on some surprising roles here or there by showing their range in art-house fare. And in Ferrell's case in particular, this decision to stray from their comedic domain can be evidenced in films such as Melinda and Melinda , Winter Passing , The Producers and the masterful Stranger Than Fiction . Yet despite the brief outings into serious terrain, most of the SNL ensembles' cinematic output has reinforced the given “type” they've taken on from Chris Farley's less-than-bright gentle giant to Tina Fey's uptight smart girl. However, in terms of not only the sheer box office success of his combined efforts but also the amount of work he's completed in a mere decade, Ferrell has proved that far from being a one-trick pony, he has staying power. And one of the things that has allowed Ferrell break from the pack much faster than his SNL colleagues is that he's latched on to not one but two distinct “characters” that he continually alternates from his playbook again and again, thereby ensuring we don't tire of the man or dismissing the latest Ferrell film with an apathetic “oh, he's doing that again,” reaction. Skilled at playing two sides of the same coin of extremes, Ferrell frequently eases between roles as the earnest everyman of Melinda and Elf and dynamic portrayals of unbearably arrogant asses in Anchorman and Talladega Nights . And in taking a cue from Sandler's blend of sweet and sour – he even manages to morph from one extreme to the other quite believably as in Step Brothers and Kicking and Screaming . But as evidenced in the at times furiously flawed nonetheless inventively fast-on-its-feet funny buddy cop movie send-up The Other Guys , striving to achieve this many highs and lows in a single picture can make an already unstable formula downright volatile, where long after the final credits roll we remember the misses more than the hits. And while only one poor choice in the form of a joke that goes too far or a badly constructed supporting player can tip the scales, The Other Guys has the misfortune of beginning on the wrong tonal beat and never finding the right harmony as it continues. While Guys has the fact that it debuted after Kevin Smith's painfully unfunny '80s inspired buddy cop movie Cop Out working to its advantage, unfortunately because the British import Hot Fuzz aced this genre on the same level that Mike Judge's Office Space did cubicle humor, Guys has pretty big shoes to fill. 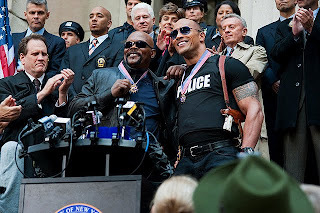 Luckily, the premise is ingenious and it begins on a tongue-in-cheek high note as near superhero cops Dwayne Johnson and Samuel L. Jackson achieve a movie star status in the NYPD, driving through buildings, putting seas of citizens at risk at the cost of millions in property damage all in the name of Hollywood blockbuster style justice. Needless to say when you contrast Johnson and Jackson with Will Ferrell and Mark Wahlberg's laughingstock NYPD characters who live for paperwork and accidentally shot Derek Jeter respective, the literal “other guys” should've been easily relatable underdogs for whom we can't help but root. However, we're on the defensive right along with Ferrell from the first moment that Wahlberg opens his mouth as screenwriters Adam McKay and Chris Henchy misgauge the funniness of Wahlberg's frustration and his rage goes way past uproarious to upsetting when faced with his partner's desire to spend his days at his desk. The anger spewed out of a man so often cast as a clean-cut nice guy is a strange fit indeed. 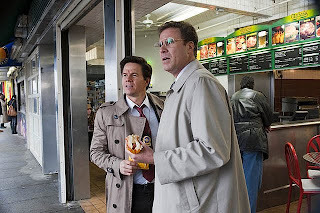 Yet as hard as it is to adjust to Wahlberg in the tantrum heavy role, it's even harder when you realize they've made him so extreme that in any other post-SNL movie, he's be playing the villain rather than one of the heroes. Although the fast-paced rapid fire wit of razor sharp one-liners is to be admired as though McKay and Henchy engaged in a comedy writing marathon based on both one-upmanship and number of gags contained in the 107 minute running time, the tenor of the humor is always low, rough and tragically filled with a few too many out-of-tune notes that pulls you right out of the rhythm of laughter. And while a certain amount of man's man misogyny is to be expected in cop movie conversations, these moments serve to illustrate not only how much we miss the balance of Ferrell's contributions as a screenwriter but also why it's a good reason to edit out the unfunny material that inevitably comes through. From Wahlberg's predictably estrogen themed put-downs about Ferrell's car to the film's treatment of co-star Eva Mendes in particular, we go from great politically incorrect shocking one-liners to a disturbingly dark level of hostility that rears its head before we've even reached the film's halfway point. Moreover, the scenes with Eva Mendes as Ferrell's gorgeous '50s housewife style doctor wife are wasted completely as Ferrell and Wahlberg shoot for laughs on opposite sides of the court with neither one scoring as Wahlberg is in disbelief of her beauty and marriage and Ferrell deals with Mendes about as well as Wahlberg treated him in their first shared scene. While it's woefully uneven, it's nonetheless elevated by a refreshing return to comedy from Michael Keaton whose work in Other Guys marks the finish of a great one-two punch following his Toy Story 3 scene stealing voice-role as Ken and laced with a great and quite surprising politically topical final storytelling wrap-up. 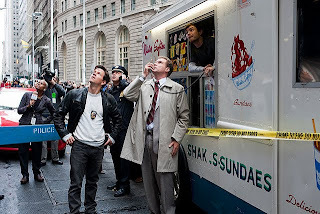 Although Other Guys distracts you with the sheer power and speed of its jokes, ultimately you're left with a bad aftertaste caused by its emphasis on Wahlberg's mean-spirited main character motivation rather than the same even-underdogs-have-their-day humor that's flowed through other post-SNL vehicles including Ferrell's vastly superior work with Adam McKay. Featuring a great novelty "mom-mentary" feature commentary track with the mothers of Ferrell, McKay and Henchy wherein Will's mom discusses his femininity and Adam's mom jokes about hugging Dwayne “The Rock” Johnson before pondering the prospect of feeling up Mendes, Sony's technically superb Blu-ray/DVD/Digital-Copy combo pack also contains over a hundred minutes of extras along with an unrated version of the film.